Once upon time, Disney made movies that made me feel lost in wonder for days. Falling in love with a princess and her love story, hoping to have one of my own someday. Watching the movies for hours and hours to the point I can react every line and movement. Looking in the mirror while getting ready for the day; hoping when I grow up, I will be as beautiful as those princesses. Going to the school library to get every fairy tale I can get my hands on and stare at the pictures during class. Singing the disney's song that just stay in the head. The Snow Queen, is a complicated story about the struggles between good and evil. A love between two friends is so strong that age had no matter of what one in love can truly do for one another and...A Queen can be seen as not truly a villain but more of a victim. The Story had a lot of religious hints in it..Well, I really shouldn't say hints since in the end the grandma reads a passage from the bible. However, it doesn't hurt the story and makes anyone that loves to study characters to take a step back. I have to say heading the story of the Snow Queen...I felt sorry for her and it made me sad that she didn't get a real happy ending in my eyes. Frozen takes the story of the Snow Queen and makes it, truly it's own story. Disney has been known to changes Fairy Tales which I never mind. It's nice seeing different takes of ones story. 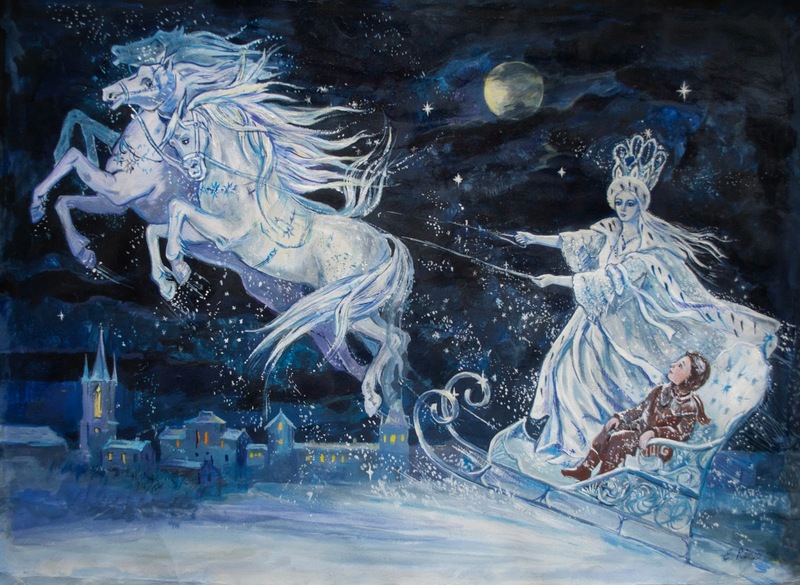 However, any one that knows the story of the Snow Queen knows this is not even close to the tale but that doesn't mean this take of the classic story isn't at good. In fact, it's truly prefect! An accident changes everything for the two sisters and their relationship was no longer what it use to be. 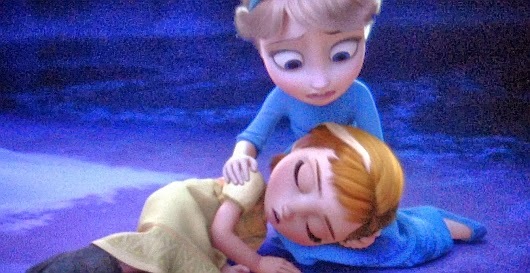 Anna loses her memory of Elsa having powers and what happened to her. Seeing Anna trying to get her sister out of her room to play. "Do you wanna to build a snowman?" -Anna I have to say this song, shows how much Anna misses her big sister and is so left in the dark of what Elsa is going through. When they lose their parents and Anna knocking once more, the lyrics change to show how alone Anna is without sister. "Just let me in." This song is so fun and yet so very sad. You truly feel the loneliness between both sisters. As much as Elsa wants to be close to her sister and let her in, she doesn't out of love. She doesn't ever want to hurt her sister again. Anna keeps trying until they are teenagers and lets her sister be but comes back knocking after losing their parents. Time passes since the lost of their parents. The dance is about to begin and the gates is about to open. Anna is overjoy as Elsa is uneasy but it's only for today. For the first time in forever- Another great song to show what the girls are going through. Anna reminds me a little of Ariel from the little mermaid during this song. Anyways, Anna is like a little girl during christmas morning who can't wait to open her gifts. When it's time for Elsa be Queen. The gates open after many years of being shut. Anna couldn't be happier with the chance to met other people and enjoy a ball. During her careless she bumps into meeting a charming Prince named Hans. She falls really, really, really hard for this prefect guy. Another character named Duke whom is quite silly and foolish but is quite two face as he wants to find out why the gates have been locked for so long. Elsa and Anna finally speak to one another and years of barely saying a word to one another. You can see how much they are alike in ways. They are quite a pair the two girls. They are different, yet the same. However, Anna says that should do this all the time but..sadly Elsa can't let that be. Anna moves away, upset that the gates will close again. However, that frown fades when she bumps into the prince again. Love is an open door- This song is super cute. Hans and Anna sound good together and has a lot of screen with them being playful together. Again, it's really cute! I couldn't stop grinning at the two. They want to get married right away and tells Elsa they are going to get married. Of course, Elsa's reaction had to be everyones thought of someone marrying someone they just met. This upsets Anna and starts the drama of everyone in the party finding out about the Queen's secret. Elsa runs away from her kingdom, covering it with snow. Anna goes after her sister as Hans stays behind to help the kingdom. "Let it go"-Elsa. This song has to be the best song in the movie. Elsa's secret is now known and doesn't let it bother her instead she sees what she can do. The song builds up more and more and leaves with her giving a sassy tone. "The cold never bother me anyways." The images during this song is truly a masterpiece. I'm not sure what else to say about it...other then it's just prefect...prefect...PREFECT! Anna ends up meeting a young man named Krisoff and reindeer named Sven. Krisoff gets kinda forced to help Anna with her search and the two of them build a friendship and...slowly starts to be something more. Krisoff talks for Sven which is quite interesting and funny to watch. It's great they didn't have animals talking in this movie. I think if they did it would had taken a bit of the charm of this movie away. So good call, Disney. song "let it go" Olaf, the snowman is so friendly and very funny. I have to say when I first saw the trailer, I thought I was going to hate him but instead I was happily wrong. He has such great one liners. Olaf is the character made up by Elsa when they were kids and Anna is taken back when she realizes who he is. He even says some lines that the girls use to say when they were kids which makes him even more wonderful. 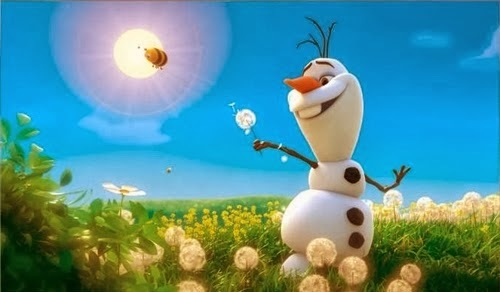 Olaf dreams of summer but doesn't know what heat can do to him. Finally, making it to where Elsa is. Anna has a moment alone with Elsa seeing her in a different light. Anna wants her big sister to come back and sings the song "For the first time in forever" but changes the lyrics once more. During the song, Elsa finds out her powers are truly out of her control. Unknowing that she could even bring things to life like Olaf but she cause a awful snow storm upon their kingdom and well...everywhere. Seeing that she isn't free and never will be. Her fears come rushing back. Elsa freaks out as Anna tries to calm her down but doesn't work in the end. The "part two" of the song gave me chills. I love the part when Elsa looks at her reflection. I held my breath for just a second of her looking at herself. To me, it felt like Disney was saying to the original Snow Queen, we understand your pain. Well...most likely that's just my overactive imagination coming out. Sadly, what Elsa fears comes true as she ends up hurting Anna again. She pushes her sister away once more unknowing what she had done. Elsa makes a snow monster that throws all them out of her castle and is once again alone with her powers. Elsa does panic as she tries to calm herself but sees how trapped she is. After being throwout, Anna's hair starts to turn white. Fearing over what could be happening to Anna, Krisoff goes to his family for help. Krisoff was taken in by the trolls which didn't show themselves at first and looked like just rocks to them. I have to say Olaf's reaction was just great. I couldn't stop laughing. The family is overjoy seeing Krisoff being a girl, home. Although, it wasn't what they were talking and a misunderstanding causes for a song. Well, this is a musical. Fixer upper- Now, I have to say this song didn't really grad me as the other song did. However, it was still a good song. Olaf dancing and laughing along the whole song was just great. It's fun to watch until Anna nearly pass out as her hair turns more white. Finding out of an act of true love is what will save her. Krisoff rushes Anna to Hans to save her. Seeing the look upon Krisoff as he let her go was heartbreaking. He walked away and as Sven tried to tell him to go back. Krisoff didn't voice what he was trying to say since he didn't want to hear it. This part was beautifully done. You really see how much pain Krisoff is over realizes he really did like Anna and letting her go to someone else had to be really hard for him. After fighting himself, he finally...you guess it. Runs to her. Ah, so romantic! Before all of this epic, even more epic happened. Hans realizes that Anna is in trouble when his house come back without the princess. Getting the men to come along to get the sisters with no harm done upon the Queen. They rush off with two men that was order to kill off the Queen by Duke himself. As they reach the ice castle, they fight the snow monster and reach inside. Elsa fights back and nearly almost kills the two men that attacked her until Hans stops her. She gets hurt in the end and gets locked away. 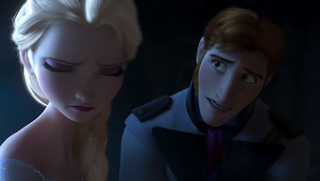 Hans talks to her telling her to make it stop but Elsa tells him painfully that she can't. It looks like Hans is trying to keep the peace as she speaks softly towards the Queen and it's sad seeing the expression on poor Elsa's face. Now, here's the biggest spoiler in the movie and if you haven't seen it...Maybe you should stop reading now...I have warned you. Hans is left alone with Anna as she tells him that only true love can save her. Hans is about to kiss her then pulls back just before their lips touch. "Oh, Anna...If only someone loved you." Many viewers were shock and all good reason to. There wasn't much of a thought that Hans could ever be seen as a bad guy. Some viewers of the movie didn't like the idea of Hans actually being a villain. I, on the other hand, loved it. Truly, truly loved it and you know what? It made me loved the character more and made me wish we learned more about his past. Well, anyways he tells Anna that he didn't loved her and simply used her to get a step closer to be King. He was going to wait to killed off Elsa and Anna but it looks like he doesn't have to. Taking out of the fire and locking Anna away to die. He knows that he has everyone's trust and works his charm telling everyone that Anna passed away because of her sister and told everyone with a heavy heart...yes, you may roll your eyes. To put Queen Elsa to death. Olaf comes in where Anna is and starts a fire to keep her warm. 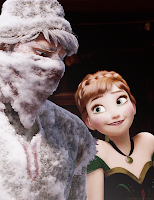 However, Anna tries to stop him but Olaf doesn't care after finding out what heat does to him. Olaf talks about love and realizes that Anna is pretty clueless about what love is. After a heartwarming moment from the two, Olaf tells Anna that Krisoff is coming back. Anna forces herself up and goes after him. Elsa breaks free until Hans reaches her. Telling her that her sister is dead because of her. Elsa breaks down causing the snow to stop in the air. Hans moves in with his sword about to end her life. Anna sees Krisoff but looks over and sees her sister in problem. She runs towards the two and stops Hans and saves her sister. Things I like about the movie; I loved the songs and the characters. Even the side and background characters were all so lovable and fun. The background was breathtaking and the colors were great. I love the two main girls dearly. It hard to pick which one is my favorite. I love how funny Anna is and how dramatic Elsa is. The trailer is truly awful which is odd since trailers are known to make bad movies look good but the trailers for this movie didn't do any good when it comes to how wonderful this movie truly is. If it wasn't for the reviews I heard online about the movie. I wouldn't have gone to see it. I have to say overall. This is a wonderful movie and I can't wait for the dvd! Actually, I'm dying for it. I hope it comes out soon. I've seen comments of people seeing the movie more then once. One person even saw it 12 times! If you haven't seen it or if you know someone that haven't they need to. Disney is reminding lately, why I loved them so. Well done, Disney!